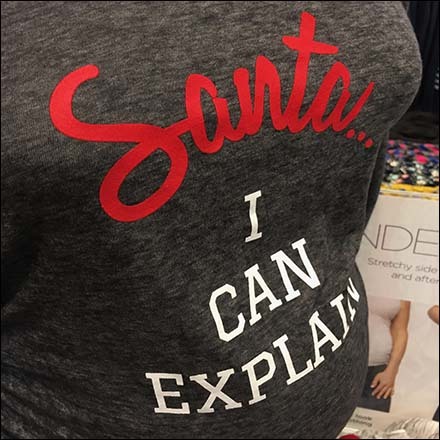 This I Can Explain This Pregnancy T-Shirt maternity top is both Seasonally fun, and give wearers the opportunity to stay off the Naughty List and on the Nice. A fan of merchandising that visually supports Holiday Themes, this is the ultimate for the Motherhood Maternity retail chain. Consider the full I Can Explain This Pregnancy T-Shirt display in the gallery of images. Seen at The Shoppes at Montage Mountain, Music PA.